Trim the chicken breasts and slice horizontally half way through, taking care to retain the shape. Make a marinade using 2 tbsp Patak's Tikka Masala Spice Paste and the Greek yogurt and mix well with the chicken. Cover and marinate in the refrigerator for a minimum of 2 hours. Heat the oil in a pan, add the cumin seeds and when they begin to crackle add the chopped onions and fry until the onion is golden brown. Add the ginger and garlic Spice Pastes and fry for another minute. 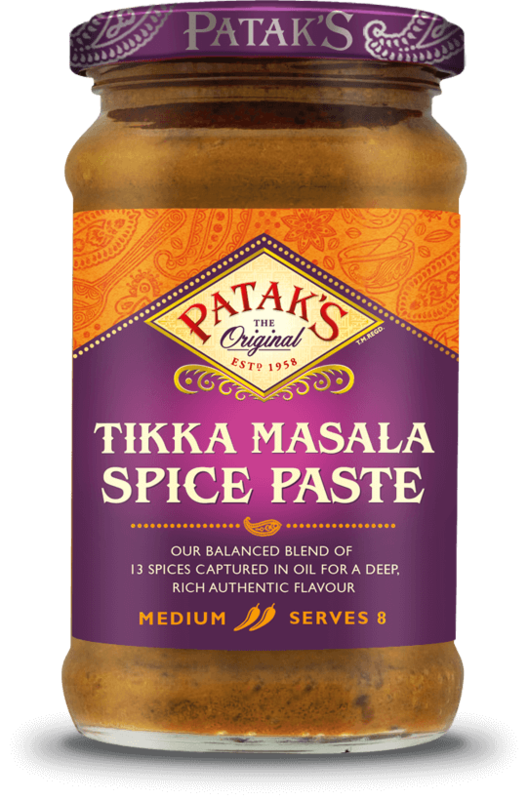 Add the remaining 2 tbps Patak's Tikka Masala Spice Paste and continue to fry for 2 - 3 minutes, adding a little water if the mixture begins to stick to the base of the pan. Add the canned and fresh tomatoes and cook for a further 5 minutes. Stir in the cream and water and simmer until the sauce thickens. Sprinkle in the crushed black pepper, lemon juice and fresh coriander, mix well and adjust the seasoning if required. Add the baby spinach leaves and cook for 1 minute until wilted. Pan-fry the chicken breast pieces for 3 - 4 minutes, or until cooked through (depending on thickness), on each side and serve hot with the spinach and tikka masala sauce.